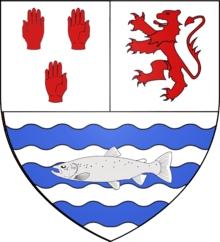 Clann Cholmáin is the name of the dynasty descended from Colmán Mór (Colmán Mór mac Diarmata), son of Diarmait mac Cerbaill. Part of the Southern Uí Néill — they were the kings of Mide (Meath) — they traced their descent to Niall Noígiallach and his son Conall Cremthainne. Related dynasties descended through Conall Cremthainne and Diarmait mac Cerbaill included the Síl nÁedo Sláine, the kings of Brega, descended from Colmán Már's youngest brother Áed Sláine, and the less important Clann Cholmáin Bicc (or the Caílle Follamain), descendants of the middle brother, Colmán Bec. The Kings of Uisnech, among others, belonged to Clann Cholmáin. Nebulae discutiuntur? The emergencer of Clann Cholmain, sixth-eighth centuries, Ailbhe Mac Shamhrain, in Seanchas:Studies in Early and Medieval Irish Archaeology, History and Literature in Honour of Francis John Byrne, ed. Alfred P. Smyth, pp. 83–97, Four Courts Press, Dublin, 2000.